Which structure has optimal resistive switching characteristics? Resistance switching of random access memory has been widely explored due to its potential for replacement of ﬂash memory in the next-generation nonvolatile memory applications. One of the problems with resistive switching materials is the variations of switching parameters, which will deteriorate the device endurance. 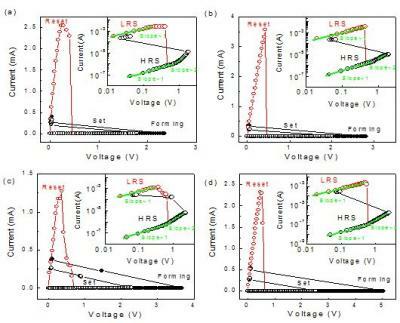 Many methods have been tried to improve the resistive switching performances, such as doping in the insulator film, using appropriate electrodes and inserting interlayer between the electrode and the insulator film. However, the effect of TiOx interlayer on the ZnO film has not been investigated as much. In a recently published Surface Review and Letters paper, Pt/TiOx/ZnO/n+-Si structures with different thickness of TiOx interlayer were fabricated and the effects of TiOx interlayer thickness on the resistive switching performance were investigated. In the paper, the researchers fabricated Pt/TiOx/ZnO/n+-Si structures by inserting TiOx interlayer between Pt top electrode and ZnO thin film for nonvolatile resistive random access memory applications. They investigated the effects of TiOx interlayer thickness on the resistive switching performance. The findings show that the Pt/TiOx (5nm)/ZnO/n+-Si structure has the optimal resistive switching characteristics.